3 Bedroom Semi Detached House For Sale in Stafford for Offers in the region of £170,000. UPVC front double glazed door. Double glazed uPVC window facing the side. UPVC front double glazed door. Radiator, tiled flooring, ceiling light. UPVC French double glazed door. Double glazed uPVC window facing the rear. Radiator, ceiling light. UPVC back double glazed door. Double glazed uPVC window facing the rear. Radiator, tiled flooring, tiled splashbacks, ceiling light. Composite work surface, wall and base units, one and a half bowl sink with drainer, integrated oven, integrated hob, stainless steel extractor, integrated dishwasher. Double glazed uPVC window facing the front. Radiator, tiled flooring, ceiling light. Ceiling light. Low level WC, wall-mounted sink. Space for appliances, Roll edge worktops. Double glazed uPVC window with frosted glass facing the side. Heated towel rail, laminate flooring, part tiled walls, ceiling light. Low level WC, panelled bath with mixer tap, shower over bath, pedestal sink with mixer tap. 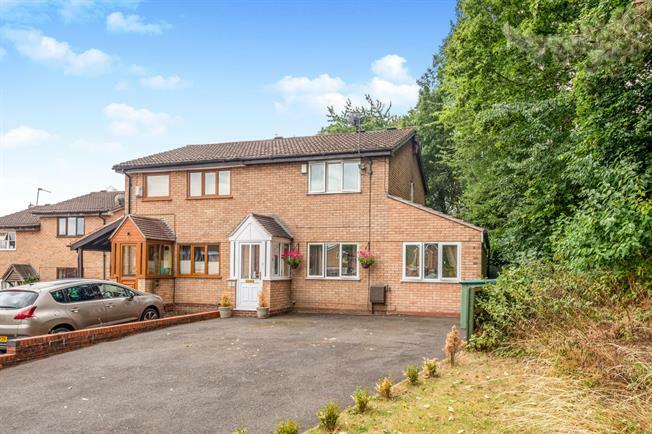 To the front there is a driveway providing ample off road parking, lawned garden. To the rear there is a decked patio area leading to lawned garden and a selection of well stocked flower borders.